Sunnyside's flag was adopted on April 11, 2016 the design is based on original artwork by Kathleen Rogers. The flag depicts different farm products that have been grown and harvested here since Sunnyside was established in 1902. The sunflower represents Sunnyside itself. "The official flag of the City of Sunnyside shall be a banner of light blue on the top fading to dark blue on the bottom. The flag shall have a circular image in its center depicting Sunnyside’s agricultural diversity. The image shall be that which was created by artist Kathleen Rogers in 2015. 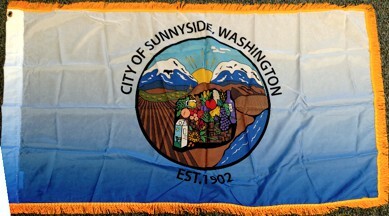 The words “City of Sunnyside Washington EST. 1902” shall be inscribed around the circumference of image. [Ord.2016-11 § 1, 2016.]" The symbols displayed are based on the sun shining (hence the city's name) and a cornucopia of fruits to commemorate its agricultural heritage. The organization in charge of this was the Sunnyside Arts Commission. The first raising of the flag was carried by "Tony Castillo and Dennis Blumer of the Sunnyside Fire Department raise the city’s official flag over City Hall for the first time yesterday." "On September 16, 1902, residents voted 42 to one to incorporate as the town of Sunnyside. By state law a town needed to have 300 citizens in order to legally incorporate. With 314 residents, Sunnyside was just eligible to legally vote for incorporation."